NASA's rover Curiosity crawls up the side of Vera Rubin Ridge on Mars' surface in January 2018. Mount Sharp — a 3-mile-high mountain — can be seen in the distance. "It kind of frustrated me that we didn't have a surface gravimeter on Mars," says Lewis, a member of the Curiosity science team, and an assistant professor in earth and planetary sciences at Johns Hopkins University. You can learn a lot about the geology of a planet by measuring subtle changes in its gravity. High-density rocks give a stronger gravity-signal than low-density rocks. But to make measurements of gravity, you usually need to have an instrument called a gravimeter. One day, Lewis started thinking about something that popped up regularly on the rover's daily activity schedule. "Turns out, every day we don't drive with the rover, there's this little rover activity called the SAPP-RIMU data activity," Lewis says. This mosaic of images from the Mast Camera on the Mars rover Curiosity shows Mount Sharp on the Red Planet's surface. The mountain, towering from the middle of a crater, is roughly 15,000 feet tall. SAPP stands for "surface attitude position and pointing." The SAPP-RIMU data activity is something engineers use to determine the rover's precise orientation on the planet's surface. Inside the RIMU are three devices to measure acceleration — similar to the accelerometers inside a smart phone that measure the phone's movements. Kevin Lewis had a kind of epiphany. "We don't have a gravimeter on the surface of Mars, but we do have accelerometers," he says, "and gravity is just an acceleration." You may not think of gravity that way, but you can, and scientists do. So with the help of engineers Stephen Peters and Kurt Gonter at NASA's Jet Propulsion Laboratory, he was able to adjust the way the data from the RIMU were handled; that gave Lewis his gravimeter. He knew just what he wanted to do with it: Try to figure out how a 15,000-foot-tall mountain could form in the middle of Gale crater, the crater Curiosity landed in. It's a question many scientists have puzzled over. "There have been basically two different schools of thought," says Mackenzie Day, an assistant professor in the department of earth, planetary and space sciences at UCLA. "Craters are fundamentally big holes in the ground," Day says. "So they're a really good place to accumulate things: to accumulate sediment; accumulate dust and sand." 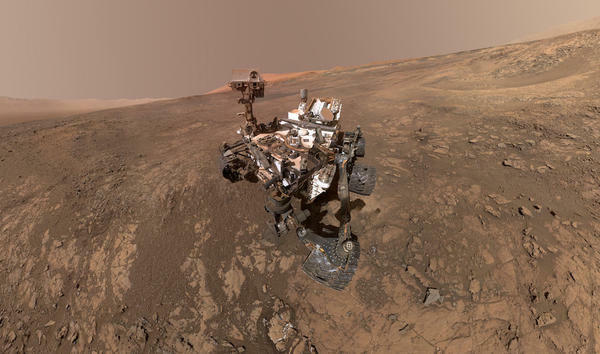 Among the questions scientists have been puzzling over, Day says, is this: Was Gale crater once filled to the rim with sediment, and then most of that material eroded away, leaving behind what is now called Mount Sharp? "Or," Day says, "is Mount Sharp something that developed in the middle of the crater — as a sort of stacking of material in the crater center — from winds coming down the sides of the crater rim?" Could blowing sand and dust below really build a 3-mile-tall mountain? Possibly, although Kevin Lewis admits it runs against our expectations. "We don't usually see mountains growing up as a haystack on the Earth," Lewis says. If the haystack model is right, the rocks at the base of Mount Sharp wouldn't be very dense. "What we found in this study is the rocks are surprisingly low density," Lewis says. So the haystack theory may be right, as he and his colleagues report in the journal Science. Lewis says he plans to keep collecting data from his MacGyvered instrument to see if the initial results hold up. There is a three-mile tall mountain in the middle of a crater on Mars, and scientists have been debating how it got there. A new study suggests the mountain is largely made from just dust and sand. To get the data for that conclusion, the researchers MacGyvered a navigation instrument on the NASA rover called Curiosity. NPR science correspondent Joe Palca has the story. JOE PALCA, BYLINE: How do you know what a planet is made of? Well, you can learn a lot about the geology of a planet by measuring subtle changes in its gravity. High-density rocks give us stronger gravity signal than low-density rocks. But to make gravity measurements, you usually have to have an instrument called a gravimeter. KEVIN LEWIS: And it kind of frustrated me that we didn't have a surface gravimeter on Mars. PALCA: Kevin Lewis is a planetary scientist at Johns Hopkins University and a member of the Curiosity rover science team. One day, Lewis started thinking about something that popped up regularly on the rover's daily activity schedule. LEWIS: Turns out every day we don't drive with the rover, there's this little five-minute activity called the SAPP-RIMU data collection activity. PALCA: The RIMU is a navigational device, and the SAPP-RIMU data activity tells engineers the rover's precise orientation on the planet's surface. Inside the RIMU are three accelerometers, and accelerometers measure acceleration - duh. You actually have accelerometers inside your smartphone that measure your movements. Anyway, thinking about these accelerometers in the RIMU, Kevin Lewis had a kind of epiphany. LEWIS: We don't have a gravimeter on the surface of Mars. But we have accelerometers, and gravity is just an acceleration. PALCA: You may not think of gravity that way. But you can, and scientists do. So by adjusting the way the data from the RIMU were handled, Lewis now had his gravimeter. And he knew just what he wanted to do with it - try to figure out how a 15,000-foot tall mountain could form in the middle of Gale crater, the crater Curiosity landed in. It's a question many scientists have puzzled over. MACKENZIE DAY: And there sort of have been two different schools of thought. PALCA: Mackenzie Day is a planetary scientist at UCLA. DAY: Craters are fundamentally big holes in the ground, so they're a really good place to accumulate things - to accumulate sediment, accumulate dust and sand. PALCA: Day says the question is, was Gale crater once filled to the rim with sediment, and then most of that material eroded away leaving behind what's now called Mount Sharp? DAY: Or is Mount Sharp something that developed in the middle of the crater as sort of a stacking of material in the crater center from winds coming down the sides of the crater rim? PALCA: Could blowing sand and dust really pack together to build a three-mile tall mountain? Possibly, although Kevin Lewis says it runs against our expectations. LEWIS: We don't normally see mountains just growing up as a haystack on the Earth. LEWIS: And what we found in this study is that the rocks are surprisingly low-density. PALCA: So the haystack theory may be right. Lewis says he plans to keep collecting data from his MacGyvered instrument as Curiosity climbs up Mount Sharp to see if the initial results hold up. Joe Palca, NPR News. (SOUNDBITE OF THE POLISH AMBASSADOR'S "FOREST FUNK") Transcript provided by NPR, Copyright NPR.